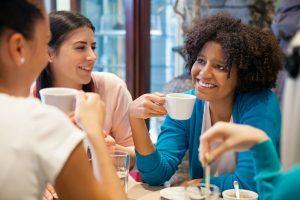 These are common hot thoughts and beliefs of people who experience social anxiety when making conversations with strangers and acquaintances, especially in group settings. This kind of distorted thinking makes us feel self-conscious and anxious about making conversation, and leads to avoidance and other safety-seeking behaviors that hurt our conversations and our self-confidence. Well, if you’re like most socially anxious people, there’s probably a kernel of truth in all these thoughts and beliefs, surrounded by a lot of distorted and self-defeating ideas. One step in overcoming your social anxiety about chatting is to apply the skill of cognitive restructuring so that your thinking is more realistic, helpful and self-compassionate. Here are some examples of having applied cognitive restructuring to these hot thoughts and core beliefs that you may be able to adapt to your own experience. It’s not just our attitudes that need adjusting if we want to feel less anxious and more enjoyment when chatting with others. We need to gradually let go of some of the behavioral crutches that we lean on too much in an effort to cope with our fears. These safety-seeking behaviors may sometimes lessen our anxiety in the short run. But they often make our conversations go poorly and increase our anxiety in the long run. They also prevent us from learning that our disturbing hot thoughts and core beliefs are distorted, which stops us from enjoying the conversations and building self-confidence. Here are some examples of self-defeating safety-seeking behaviors, which I’ll call crutches, and their more helpful alternatives, which I’ll call strengths. Conduct a series of experiments in which you drop any of these crutches that you’re used to relying on. This allows you to test out your hot thoughts and core beliefs. Doing so may temporarily increase your anxiety, so you may want to take small steps and make only one or two changes at a time. You will feel more and more comfortable over time as you see conversations tend to go better than you expected by using your strengths rather than relying on your crutches. You’ll also be gathering evidence against your distorted and disturbing hot thoughts and core beliefs which will, over time, increase your self-confidence and decrease your social anxiety. CRUTCH: AVOIDANCE. Too often we let our anxiety and disturbing thoughts lead us to avoid doing things we otherwise want to do. It may be overt avoidance, such as not attending activities, not initiating conversations with individuals, not joining group conversations. It may be covert avoidance, such as speaking little about yourself, not expressing your opinions, or cutting conversations short. There also are a variety of non-verbal behaviors that are covertly avoidant because they serve to try to get attention off yourself: averting eye contact; speaking softly or nonexpressively (eg. flat tone of voice, lack of smiling or facial expression); locking your hands so they aren’t expressive (eg. hands in pockets, arms folded, grasping drink/food/phone). Overt and covert avoidance may indeed lessen our anxiety briefly, but at a severe cost to us. Avoidance reinforces our hot thoughts and core beliefs, prevents us from learning that they are distorted, and increases our anxiety for the next time. STRENGTH: TAKING SMALL STEPS FORWARD. Set small but ideally frequent goals of moving beyond your comfort zone, gradually doing things your anxiety has led you to avoid in the past. Make sure you focus mindfully on the person, conversation or activity while taking these steps (see below). Repeat these steps until they feel more comfortable, and gradually choose more challenging steps. This strategy of taking small steps forward will help you garner more and more evidence that your hot thoughts and core beliefs are distorted and unhelpful, which will decrease your anxiety and increase your self-confidence over time. In the case of non-verbal avoidant behaviors, set alternative goals such as making more eye contact, speaking louder and more expressively, smiling more, and freeing up at least one hand when speaking. But make sure you are focusing mindfully on the conversation (below), not on self-monitoring and evaluating your behavior, while you are doing so. CRUTCH: SELF-MONITORING & SELF-EVALUATING. Ever have a “running commentary” about yourself in your mind while you are trying to engage in conversation, where you are evaluating how you think you are appearing and doing? Maybe you monitor your anxiety symptoms in an effort to control them and appear calm. 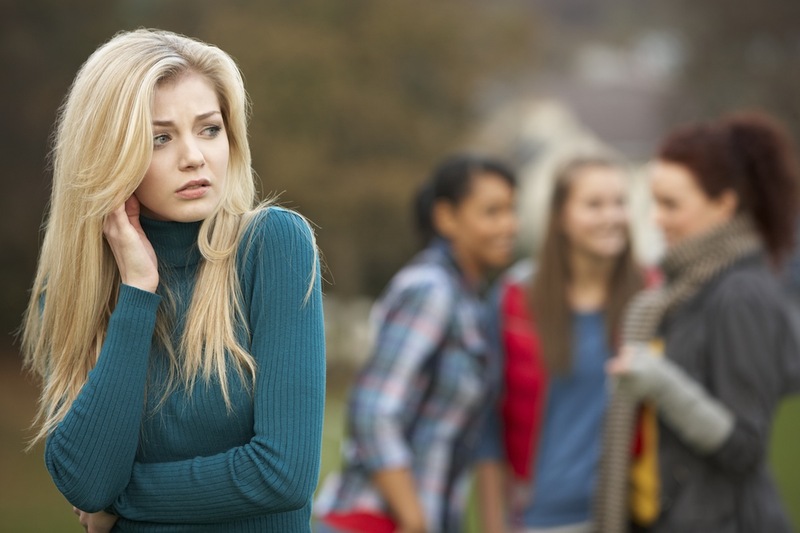 Self-evaluating and self-monitoring are extremely common with social anxiety. Although intended to help us improve, they actually distract us from the conversation which makes it much harder to actively engage. They also makes us feel anxious, embarrassed or down. STRENGTH: MINDFUL FOCUS (CURIOSITY & THOUGHT DEFUSION). Mindfulness is perhaps the most important and most overlooked social skill. Contrary to popular belief, mindfulness in NOT meditation, although that is one place to practice it. Mindfulness means paying attention to something in the present moment with interest rather than judgment. For social anxiety, mindfulness means focusing with curiosity on the person, conversation and activity in the moment, while we treat our distracting thoughts and feelings like unimportant background noise (called thought defusion). This allows us to engage more actively and naturally in the conversation, and to enjoy it more. Practicing curiosity training in our daily conversations is a great way to develop the skill of mindfulness: take interest in the person, conversation and activity in the present, and gently return our attention whenever we are distracted by thoughts and feelings. You may already do this naturally when you’re comfortable. With practice, you can learn to be more mindfully focused and defuse from your thoughts and feelings when you are anxious, too. CRUTCH: SCRIPTING. This is when we are thinking of what to say next in a conversation, or formulating what to say even before the conversation begins. Although this is occasionally useful, it much more often distracts us from listening mindfully, which prevents our brains from having things pop into mind naturally in response to what is being said. Scripting is hard work and reinforces perfectionistic beliefs—that you have to perform beautifully to be acceptable—which lessens your enjoyment and increases your anxiety. Scripting also tends to make conversations awkward and stiff, rather naturally flowing. STRENGTH: FREE ASSOCIATING. Focus mindfully on what is being said in the moment, not what to say next. Don’t script what to say, but say some of what pops into mind naturally as you pay attention with curiosity to the person, conversation and activity in the moment. Trust your brain. It’ll do the work for you if you don’t distract it with scripting! Listen with interest, and then share your reactions or questions in response. If there’s a gap in the conversation, think about the last thing that was said, or the person and activity you’re engaged with, and free associate off of that. Don’t be afraid to change the subject if your free association takes you in a different direction. Social conversations are enlivened by such natural meandering. Dropping the crutch of scripting may be scary at first, but it will soon get more comfortable as you gather evidence that you are a good enough conversationalist when you focus mindfully. CRUTCH: BEING TACITURN & TERSE. 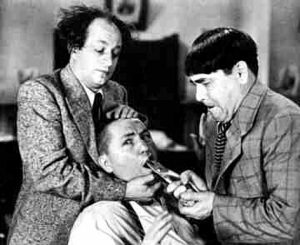 (IT’S LIKE PULLING TEETH!) Do you tend to speak very briefly whenever making a comment or answering a question? This is a common safety-seeking behavior intended to get attention off of ourselves, lest we be judged. But if you do this often, it is tends to backfire and frustrate the other person who is struggling to get the conversation with you flowing, and maybe wants to get to know you better. STRENGTH: SPEAKING EXPANSIVELY & TELLING STORIES. Make it a goal to almost always say a few sentences, rather than just a few words, whenever you speak in a social conversation. It only takes a little more effort, but it greatly increases the chances of someone connecting with something you say, and making the conversation flow. For example, if someone asks you how you are doing, it might be accurate to just say “fine”, but that closes the door to conversation. Instead, elaborate a bit: “I’ve been fine. But work’s been pretty stressful so I’m really looking forward to the weekend. I just want to sleep in and maybe see a movie or read.” With just a little more effort, you introduce 5 subjects—work, stress management, sleep habits, movies, reading—which opens the door to further conversation, and increases by 500% the chances of someone connecting with you. Also, tell an occasional short story about something you’ve experienced, as it engages people and helps them connect with you more. You’re much more likely to get a conversation flowing and connect with people when you elaborate. Yes, speaking expansively and telling stories draw attention to yourself for longer, so chances are it will initially increase your anxiety. But with mindful focus, your anxiety will decrease and you will gather evidence that most people do indeed enjoy conversing with you, and that you are good enough at making conversation. CRUTCH: INTERVIEWING. Do you tend to try to keep attention off yourself by asking an ongoing series of questions and by saying very little about yourself? Sure, questions show interest and are helpful…to a point. A long series of questions, however, tends to be tiring to both parties, and turns a conversation into an unpleasant interview. It lessens our enjoyment, makes it harder to connect with people, and reinforces our hot thoughts that people wouldn’t enjoy conversing with us. STRENGTH: BALANCING CONVERSATION. Make it a goal to speak more or less as much as the other person(s) in the conversation, and to say as much about yourself as do they. Don’t closely monitor this, however. That would just distract you from mindful, curious focus. Instead, just be lightly aware of how much you and others are talking and revealing. If you sense you are saying much less than others, or that you do react to others but are saying little about yourself and your experiences, then make an adjustment. Speak up more often and expansively, and reveal more about yourself. (If you sense you are speaking much longer than others—which is far less likely for socially anxious folks—then ask a question or two.) People can connect with you much better in conversations that are roughly balanced than in those in which you are deflecting attention. Although this may be challenging at first, it will help you gather evidence that others generally enjoy talking to you. CRUTCH: BEING (100%) CAREFUL. This is an overarching safety-seeking strategy in which we are highly cautious and risk-averse in how we approach making conversation. This strategy is generated by our perfectionistic core beliefs—that people will not like, respect or accept us if we come across imperfectly—and leads to lean on all sorts of behavioral crutches, including all those described above. While being highly careful may indeed prevent an occasional faux pas, this strategy much often prevents the conversation from flowing and greatly increases our anxiety. STRENGTH: BEING (75%) CAREFREE & TAKING SOCIAL RISKS. This indeed may be quite scary at first, but with practice, it’s so liberating! Conduct a series of conversational experiments where you gradually let your guard down further and further, speaking more freely and nudging yourself bit by bit beyond your comfort zone. You will gather evidence that this usually helps the conversation flow much better, and that most people will connect with you much better this way. On a deeper level, you will learn that you have good conversational skills after all, and that most people enjoy chatting with you despite your imperfections. In the unlikely event that, when letting your guard down, you unintentionally offend someone or say something embarrassing, simply offer a brief apology or acknowledgement, eg: “I’m sorry, I didn’t mean to offend you,” or “oops, I say silly things from time to time”. Then continue the conversation while mindfully focusing with curiosity on the person and what is being said, and treating your self-judging thoughts and unpleasant feelings like background noise. You’ll likely learn that imperfections are accepted as blips, and that things return to normal quickly. When you feel ready, you can make even more progress when you conduct a series of preplanned “social mishap experiments” where you deliberately and paradoxically choose to make a faux pas in conversation as a way to test out your perfectionistic hot thoughts and core beliefs. You could say you forgot the name of the person you are talking to, or use the wrong name intentionally during the conversation. You could ask someone something s/he already told you, or repeat something you already said. You could make a deliberate factual error, or tell someone you don’t know something you actually do know. You could be clumsy on purpose (eg. dropping, dripping, bumping), intentionally change your mind, or make a deliberately silly request. You could create anxiety symptoms intentionally (eg. blushing, sweating, jitteriness), or simply mention during the conversation that you’re anxious. After carrying out your faux pas, use a light, preplanned comment to normalize it without being defensive or overly-apologetic (eg. “oops,” “silly me,” “oh well, I guess I’m not perfect,” “blushing is one of my little quirks”) and then continue the conversation as though nothing had happened. You’ll gather evidence that being imperfect is normal, and most people don’t care about it and connect well with you anyway. Although scary at first, such paradoxical experiments tend to be quite fun and often funny, and gradually free you from the oppressive demands of perfectionism. INITIATING CONVERSATIONS. If it’s someone you know, even just a little, it’s often good to begin by free associating based on something you already know about that person. Turn that into an open-ended question, rather than a question that can be answered in one word, eg. : “How’s your dog doing?” “How was that big trip you were planning?” “What do you have in store this weekend?” If it’s a complete stranger, free associate based on what you can presume about the person given the setting or activity in which you are meeting. Again, open-ended questions are best to help the conversation flow: “What got you interested in this activity?” “What restaurants would you recommend in this neighborhood?” “How’s that book you’re reading?” However things get started, make sure you then focus mindfully and with curiosity, and share what pops into mind in reaction to what they say. JOINING CONVERSATIONS. First of all, remind yourself that you are being friendly by joining their conversation. You are not “breaking in” or interrupting. Join the circle, listen mindfully and with curiosity to what they are saying, and share your free-associated reactions as soon as possible. Introduce yourself a little later, rather than at the start, so you are expressing interest in joining their conversation rather than interrupting it or taking it over. ESCAPING CONVERSATIONS. Don’t escape at the first sign of awkwardness unless the other person very directly lets you know s/he doesn’t want to talk (eg. walks or turns away from you). The awkwardness may be a normal and temporary indication that you both need a little more time to click, that a topic has run dry, or that the other person is as socially anxious as you. Treat the awkwardness like background noise, return your attention with curiosity to the person and conversation, and share what pops into mind naturally. Don’t hesitate to change the subject if something different pops into mind, as that may reignite things. Sure, after two or three attempts, feel free to end the conversation if you aren’t beginning to enjoy it. ENDING CONVERSATIONS. There are many ways, so don’t worry perfectionistically about doing it the “right.” It can be as simple as thanking the person(s), saying it was good to talk with them, and then moving on. You don’t have to give a reason or make up an excuse (another crutch!) to leave the conversation. And if you so desire, take one additional risk: share your contact information and suggest you get together in the future (perhaps to do an activity you earlier discussed together). AFTER CONVERSATIONS. No matter how well or poorly you feel the conversation went, no matter how interested or not the other person seemed to be, make sure you congratulate yourself for having been friendly, and having had the courage to take some risks, and identify each of the risks you took. Ruminating and beating yourself up for imperfections afterwards only reinforces your social anxiety and lowers your self-confidence. Instead, pat yourself on your back for each time you let go of a crutch and used a strength, no matter how imperfectly, and remind yourself you can take further steps forward in the next conversation. Don’t let a disappointing conversation lead you to withdraw or leave (another crutch!). 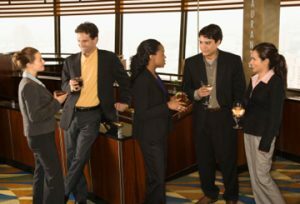 Instead, if you’re still at a group social activity or public setting, quickly go on to talk to someone else so that you can gather further evidence that people are different, and while some people may not click well with you conversationally, others indeed do. Try out any of the guidelines described above on your own, or with the support of a trusted friend or support group. You may find that you can make step-by-step progress without the guidance of a therapist. However, most socially anxious people find they can make more progress with the guidance of a cognitive-behavioral therapist, whether in individual or group CBT. Cognitive-behavioral therapy has been demonstrated by outcome studies to be the most effective treatment for social anxiety disorder. Check out our earlier blog post on social anxiety and small talk. The National Social Anxiety Center is a national association of regional clinics with certified cognitive therapists specializing in social anxiety and anxiety-related problems. We have compassionate therapists who can help you to reduce social anxiety. Currently, we have regional clinics in San Francisco, District of Columbia, Los Angeles, Pittsburgh, New York City, Chicago, Newport Beach / Orange County, Houston / Sugar Land, St. Louis, Phoenix, South Florida, Silicon Valley, Dallas, Des Moines, San Diego, and Baltimore. Contact our national headquarters at (202) 656-8566 or visit our Regional Clinics contact page to find help in your local area.